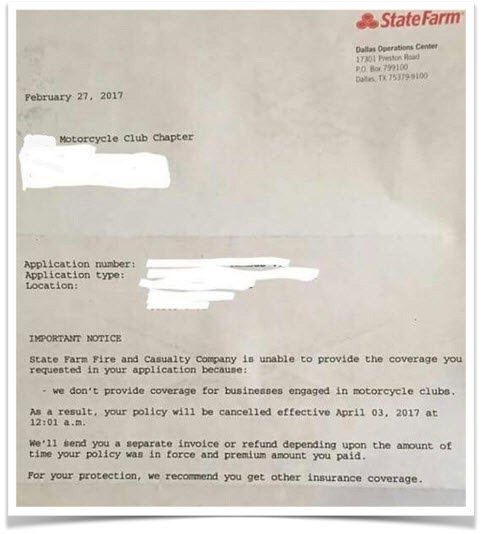 The MPP received a copy of this letter from State Farm Insurance notifying a chapter of the Legacy Vets Motorcycle Club in Florida that the insurance coverage on their clubhouse was being cancelled. State Farm’s explanation for the policy cancellation is “we don’t provide coverage for businesses engaged in motorcycle clubs.” The MPP personally verified the incident in a face-to-face conversation with the individual that provided the letter to the MPP. He is a member of the chapter denied coverage. Millions Could Be Denied Coverage? Although there might be nothing technically illegal with State Farm’s actions because they are a private company, the blatantly discriminatory policy stands diametrically opposed to a the ideas of free expression and association and, in this instance, respect for the service of Veterans. The potential number of people impacted beyond this club is staggering. The AMA estimates that there are approximately 10 million registered motorcyclists in America, many of whom belong to motorcycle clubs. And the influence of Veterans on motorcycle club culture is generally accepted as common knowledge. Beyond motorcycle clubs themselves, many of which are registered nonprofit entities, many businesses are “engaged” with motorcycle clubs. Consider the thousands of motorcycle repair and apparel shops that regularly engage in business with members of motorcycle clubs and their property. Motorcycle manufacturers as well. 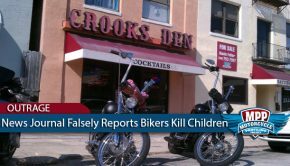 And the thousands of public accommodations, including bars and restaurants in all 50 states, that host motorcycle club charity events and engage in business with motorcycle clubs on a daily basis. 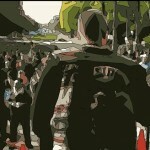 How many of the 10 million motorcyclists or their supporters in America are insured by State Farm? 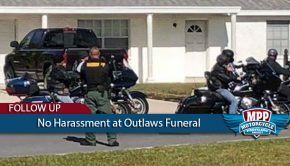 How many would choose a different company if they were aware that State Farm would not cover the property of motorcycle club’s or businesses engaged in motorcycle clubs? 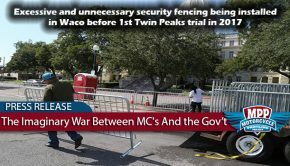 Recently, the National Council of Clubs, an organization representing the interests of motorcycle clubs and motorcyclists nationwide, wrote a letter requesting clarification of State Farm’s policy based on the cancellation notice given to the Legacy Vets MC. 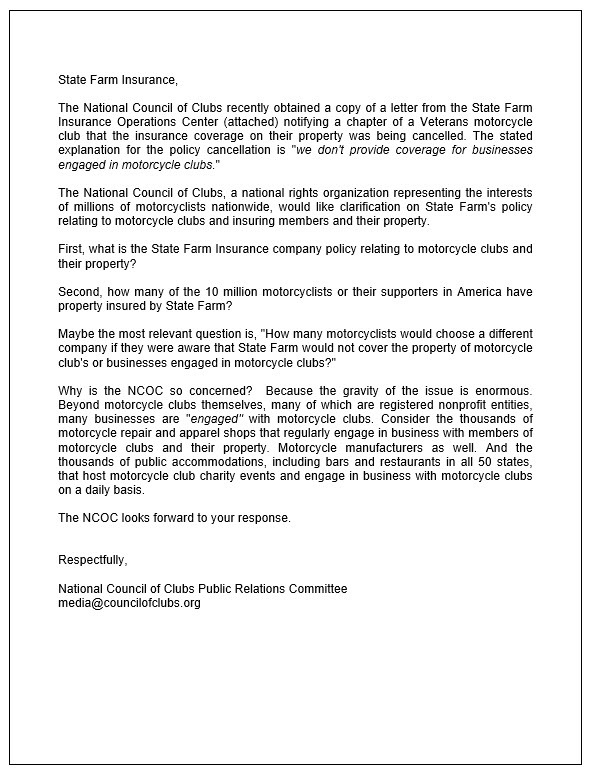 The NCOC believes that no motorcyclist or business that supports motorcyclists should engage in business with State Farm if they choose to stand by a general policy of denying coverage to businesses engaged in motorcycle clubs. To say that my wife and I are passionate riders would be an understatement. We especially love long distance riding. I’m also newly retired from the insurance business after nearly 30 years as a company officer and then as an owner. I have never worked for State Farm. But I do think that there needs to be a better understanding of how companies make these decisions. Because these decisions affect people personally, the response is also going to be personal. With that said, these decisions are made with only two things in mind. 1. Can we make a profit in this line of business? and 2. What is the loss history verses premium in this line of business? It is 99.9% of the time not discriminatory in the way it is being proposed in this article , it is risk selection, plain and simple. It’s is the math geeks that crunch the numbers. Companies, especially in Commercial insurace markets, move in and out of particular lines of business all the time. Here’s another great example, Pit Bulls. I love dogs, I have 3 of them. But the numbers don’t lie, they, and other similar breeds are responsible for the vast majority of home insurance claims. Most companies won’t take them, as no business is in business to lose money. They don’t hate dogs, They hate losing money, plain and simple. Sorry to have to explain this, but I’m guessing you won’t get the REAL response from Stats Farm. One last point, the state insurance department is very tough on companies that practice TRUE descrimination. If you think that’s the case here, time would be better sent contacting the insurace department rather than the company. You’ll get farther that way. I also want to comment on this letter, because if you are going to win your case, which I HOPE THAT YOU DO WIN, it is good to know what the internal structure is and how that works. First, motorcycle, like auto and home insurance is “Personal Lines.” (State Farm is the largest Personal Lines carrier in the US). Policies for businesses, profit or non-profit, are “Commercial Lines.” State Farm is a much smaller Commercial Lines company. Often times, although I can’t speak to State Farm specifically, the Personal Lines and the Commercial Lines areas actually function like two separate companies (something I hated when I was I the business). In many large companies these two areas don’t have a lot of contact with each other. In many cases, each area is looking to cover their own asses and seldom care about each other as each area (Personal & Commerical) are each responsible for their own results. I would focus on trying to get this letter to someone high enough, that sits above these two areas, otherwise there is a strong possibility that the letter will end up in the Commercial Lines part of the company and they are likely not going to care how it affects the Personal Lines part of the company. Stupid? YES! But that is how most of these big companies work. They are often in seperate “towers” that seldom speak to each other. Maybe State Farm is different in that regard, but I’m not holding my breath….. Cease dealing with the “Captives” ( State Farm, Allstate, Farmers, Nationwide), and use “Independent” agents who represent hundreds of carriers. GEICO is a major carrier and has excellent rates for motorcycles. Lots of carriers write “Property” coverage. you state stop dealing with captives and go independent for choice, yet GEICO is a direct wrtier and there is no choice. Well they will never insure my bike that’s for sure. I am forwarding this to all my contacts most of whom ride, build or do business with “Bikers” and are friends of many more. Thanks for the heads up. “Ride safe”. Shetland aka Jay Ottolini. I checked, I don’t have any state farm insurance. If I did I would call up and cancel my insurance any insurance and go to another insurance company. I have 3 seperate policies with State Farm that I will gladly cancel if this is not resolved in favor of the NCOC. At the risk of sounding like the voice of reason here, I would like to point out a fewthings. If you look closely at the letter, their policy was not canceled, their application was simply denied. The big difference is that State Farm didn’t pull the rug out from under them after already issuing them a policy. They applied for the policy and based on State Farm’s underwriting guidelines the policy was not issued. 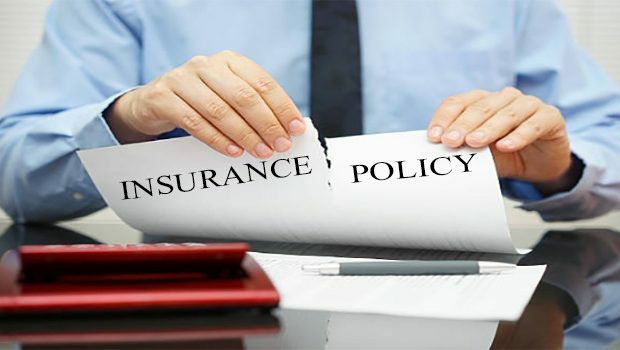 Insurance companies make decisions every day about what types of risks they will and won’t Insure based on lots of things like the profitability and the abstract nature of what they are insuring. Risks that are very black-and-white like a home policy or a policy for a single motorcycle are easy to underwrite and easy to price. That’s because the insurance company has lots of industry data to draw on regarding the amount of risk involved in the propensity for loss. More abstract risks like clubs, be it a motorcycle club or any other type, make it very difficult for any insurance company to determine what the real risk is and how to properly rate and charge for it. I suspect anybody who digs a little deeper into this would find that there are lots of clubs that many insurance companies will not insure… not because of the specific type of club that they are, simply because clubs can engage in a wide range of activities that put the insurer at a greater risk. I offer this information up as an insurance professional who is been an avid motorcyclist for more than 30 years and is well acquainted with how insurance companies determine what to insure and what not to insure. State Farm is the largest combined insurer of motorcycles and automobiles in the US. It seems if they had a discriminatory policy against motorcyclists this would certainly not be the case. The letter reads to The letter reads to me more like the motorcycle club attempted to ensure what is considered by the insurance company a commercial line, as if it were a personal line. Reading between the lines, as a former insurance broker, the policy was initially issued. 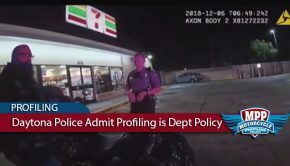 Then, the insurance which was issued when the application was filled out, Was rejected, probably when the application got to the underwriting department. They probably tried to ensure the clubhouse as if it were a someone’s private dwelling. Two entirely different things. Insurance companies don’t care about this that or the other thing politically speaking. They care if they’re making money. That’s it. This is a sad article to say the least. Typical of people with no education on the subject that want to demonize a company for the sake of misrepresenting 1 statement and presenting it as discrimination. Insurance companies look at the risk factors associated with a business. Last I checked, a lot of insurance companies won’t insure bars either. But no one’s saying it’s discrimination against vets that drink. I doubt this company is discriminating against vets. They’re likely trying to avoid a risk that is statistically likely to produce more claims and ultimately no profit for them. That’s their right same as it is yours to form a club. So get a little perspective. Stop accusing anyone and everyone of discrimination. It’s free trade which is a huge part of American culture.